Official Product of Ultimate Arms Gear, Brand New. 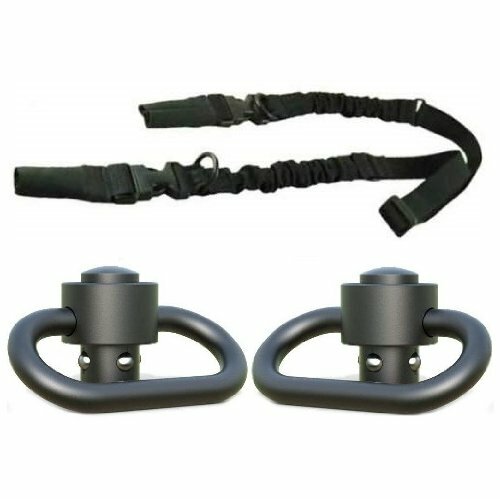 Package Includes: 2 QD Push Button Swivels + Multi Point Bungee QD Buckle System Sling. Set of Two QD Quick Detach Puch Button Swivels Steel 1.50" (1-1/2-Inch). Designed for Slings 1.50" Wide or Less. Super Heavy-Duty Push Button Swivels, Will Hold Up To Years Of Heavy Outdoor Use. Quick and Easy Installation. All Steel Construction, Black Finish. Compatibility with a Wide Variety of Sling Types and is Quickly and Easily Installed or Removed from a QD Sling Socket via its large Push Button. Stealth Black - Premium Heavy Duty 250 lb. Rated 1.25" Wide Weatherproof. Superior Quality "QD" Quick Detach Metal HK Hooks And Polymer Buckles For Either Operation With Durable And Easy Operating Buckle System. Package Includes: 2 QD Push Button Swivels + Multi Point Bungee QD Buckle System Sling. Stealth Black - Premium Heavy Duty 250 lb. Rated 1.25" Wide Weatherproof. Superior Quality "QD" Quick Detach Metal HK Hooks And Polymer Buckles For Either Operation With Durable And Easy Operating Buckle System.